This short, animated video describes what is meant by climate, its characteristics, and the range of impacts due to climate change. The difference between mitigation and adaptation is also discussed. Good teaching tips available on website. Video contrasts short-term adaptation strategies (e.g., infrastructure changes, different tree and plant selections, heat emergency plans) with long-term mitigation strategies that reduce energy consumption and hence carbon dioxide emissions on individual to global scales. Its points are made quickly and clearly. Globe 'rotates' wrong way in animation. Comments from expert scientist: There are a number of tips for teaching techniques which would be particularly useful for K12 educators, and in fact the Wisconsin Academic Model Standards for Science are linked at the bottom of the page. The top of the page has an engaging animation on climate adaptation which is just under three minutes long. The very engaging cartoon format of this video makes it very approachable for younger viewers. The webpage includes both a background essay and a number of teaching tips. 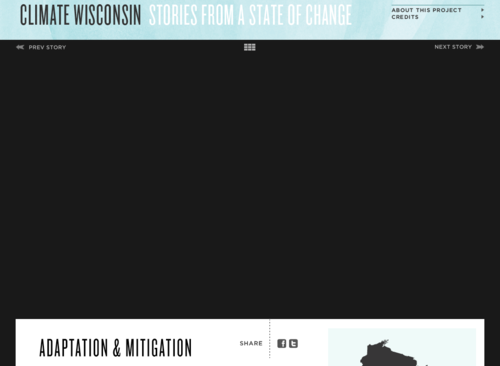 Produced by Climate Wisconsin but is a good resource for students in any region; topic is not specific to Wisconsin.